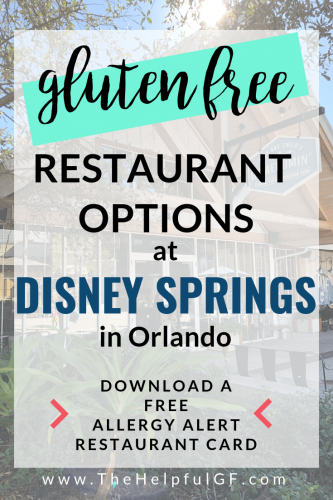 Whether you’re planning a trip to Disney World or just visiting Orlando, you MUST detour to eat gluten-free at Disney Springs! 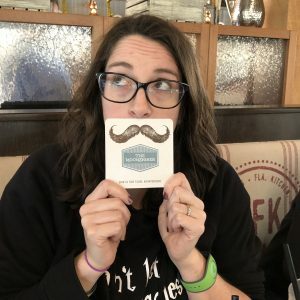 Disney Springs is not only fun, but probably one of the best concentrations of gluten-free in Orlando (or maybe even the best I’ve seen outside of large cities like NYC or LA). 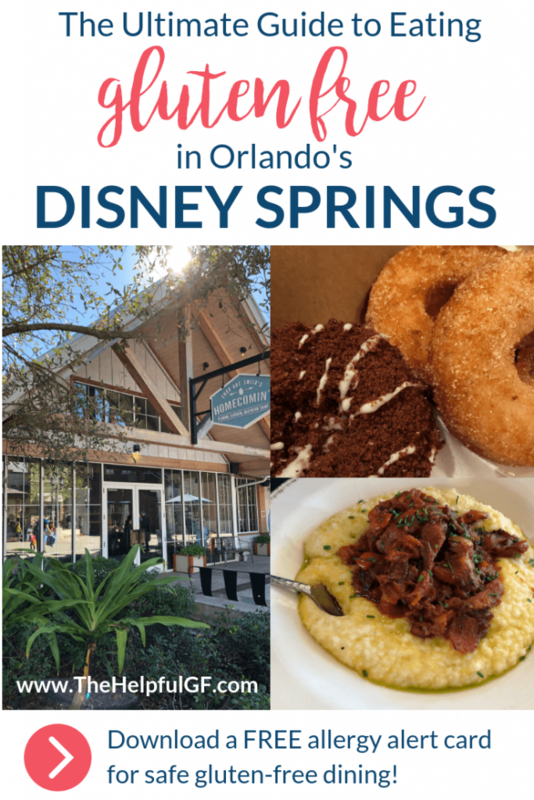 Keep reading to learn more about many of the restaurants located at Disney Springs and the gluten-free options available. Are you looking for tips on eating gluten-free at Disney World instead? Click here for my top Disney Dining gluten-free tips! While each of these restaurants below do offer gluten-free menu items, always be sure to discuss gluten-free options with your server and ensure that they are able to accommodate your personal dietary needs. Also, this post contains affiliate links. If you order through one of these links I’ll earn a small commission at no extra cost to you! My full disclosure isn’t that interesting, but you can find it here. Disney Springs is the former “Downtown Disney” area of Disney World in Orlando. It’s a district full of entertainment, dining, and shopping experiences for all ages—but without the typical Disney World crowding! Unlike the rest of Disney World, there is no park admission, nor do you need to be staying at a resort to visit. Parking is also free! While it’s lots of shopping, there is free fun for kids too such as boat rides, bowling, and dining “experiences.” My kids really enjoyed racing cars at the Lego Store and more! But the true highlight of Disney Springs for our family was the plethora of gluten-free dining options at Disney Springs! Just like regular Disney World, there are both counter service (quick service) options and full-service (sit-down) options. Some of the restaurants at Disney Springs are unique and can’t be found elsewhere. However, there are also some trusty chains found across the United States. 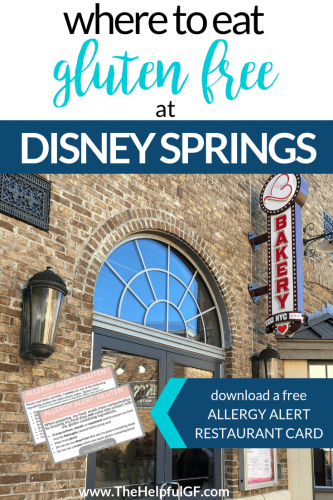 If you’re visiting Disney Springs in conjunction with a Disney World vacation, you can use your Disney Dining Plan at Disney Springs. There are options across Disney Springs for snacks, counter service, and full-service dining credits. Just swipe your magic band, and you’re all set! Hey—did you know that you can dress up your Disney Magic Bands with these super cute skins, bandits, and fasteners? These fasteners are great for helping the magic band stay on little child wrists. 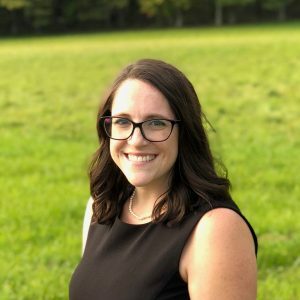 When I plan my Disney Vacations, I use a Disney Concierge like Jessica Tullino from Ears of Experience. She makes it totally easy by doing all your planning (reservations, fast passes, lodging) leaving you free to just sit back and enjoy (without any extra cost for her services)! If you’re planning a Disney vacation of any kind, I highly recommend you contact Jessica for a quote, and be sure to tell her I (Sharon McCaskill from The Helpful GF) sent you! While not every restaurant in Disney Springs is listed here, if you pop in or call ahead, the host or chef will speak to you directly about how they may accommodate your dietary restrictions. 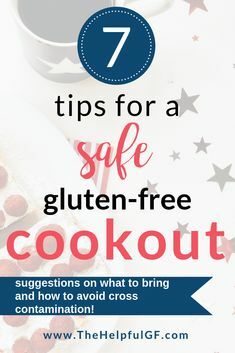 Click here to read more about how to eat out safely when you’re gluten-free. Are you ready to do gluten-free living totally STRESS-FREE? 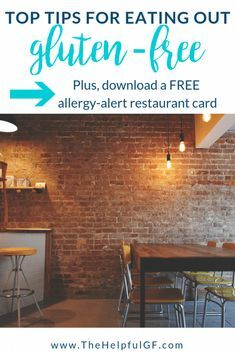 Get FREE instant access to my online library of free printables including a gluten-free dining card designed to make your gluten-free lifestyle totally easy! Blaze Pizza is a chain that you may already be familiar with for “gluten friendly” and vegan options. This makes their pizza not safe for Celiacs. Homecomin’ Kitchen is a restaurant founded by Celebrity Chef Art Smith. It features amazing southern comfort food, much of which is sourced in Florida. This is one of the first places we personally tried out in Disney Springs. Let me assure you, the food does not disappoint! 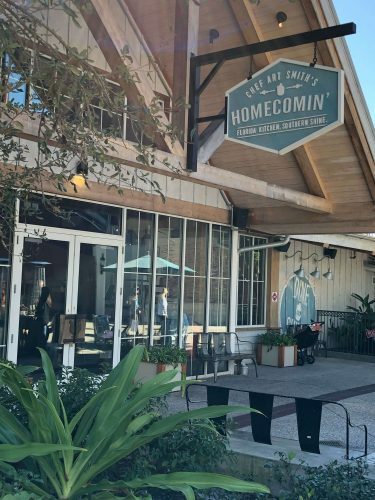 At Homecomin’ Kitchen, you can choose from Southern classics like gluten-free shrimp and grits, corn succotash, and Florida grouper. Frontera Cocina Mexicana has both a table service restaurant and a to-go window at Disney Springs. Their menus have allergens (such as gluten, dairy, and shellfish) clearly marked. However, be sure you inform your server of your dietary needs and ask questions about cross contamination. Items not containing gluten at Frontera Cocina Mexicana include their guacamole, Taqueria Salad, Carnitas, Fried Plantains, and many more menu items! House of Blues’ menu features signature fare from cities across the South and locations in cities across the United States such as Boston, Las Vegas, and San Diego. In addition to delicious Southern food, the restaurant also has an atmosphere with amazing art and live music. At House of Blues you can enjoy gluten-free menu items such as the jambalaya, blackened salmon, or a NY strip steak. Morimoto Asia is a restaurant featuring Pan-Asian cuisine designed by Iron Chef Masaharu Morimoto. The restaurant has two separate entrances—a main dining room (with a glass walled kitchen so you can watch them cook!) and a sushi lounge. Morimoto Asia features an expansive separate gluten-free menu with an assortment of gluten-free sushi, appetizers, and entrees such as Mongolian Filet Minon or Japanese A5 Wagu Beef. If you’re looking for good seafood in Disney Springs, Paddlefish is where to go! They even frequently feature live music on their rooftop. While they do not have a gluten-free menu, the servers & chefs are trained to accommodate. They generally have GF pasta in stock, please ask your server upon arrival. The salads are gluten-free if you omit the croutons. In terms of entrees, both the Prime Strip and Filet Mignon are gluten-free as well as the half chicken entree. Planet Hollywood restaurants are a destination in and of themselves with Celebrity Chef designed menu items, live entertainment, and Hollywood artifacts! With locations both in major US cities and internationally, their Orlando location is at Disney Springs. Planet Hollywood does not feature a separate GF menu, but the chefs are very knowledgeable about what you can and cannot have. They also are very friendly and happy to make accommodations. If you ask around on gluten-free message boards and Facebook groups where you should eat gluten-free at Disney Springs, you’ll definitely receive replies raving about Raglan Road (Cookes of London is also located at Disney Springs and is a counter-service extension of Raglan Road). This Irish Pub is well worth a visit—not just for the daily live music and the Raglan Irish Dancers, but for gluten-free menu items such as gluten-free Fish and Chips (made in a dedicated gluten-free fryer)! 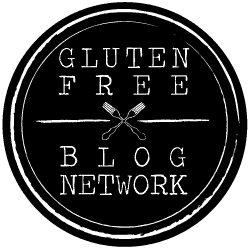 By the way, did you know that I have a exclusive Facebook group where we share gluten-free tips, recipes, and support? I’d love for you to join, click here to request access! Rainforest Café is a fun national chain that kids love—and what’s not to live with its fun atmosphere? Visit the Wild Brunch Kid Zone or host a group event or party. 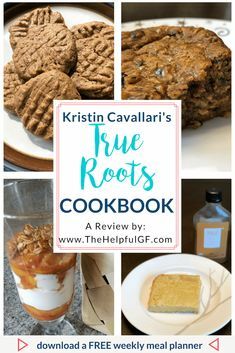 They also feature allergy friendly and gluten-free menu items made with quinoa spaghetti and some gluten-free salads such as a the kale & red quinoa salad. Splitsville Lanes is another national chain with locations in Foxboro Mass, Tampa, Miami, and Anaheim. As you can gather from it’s name, it’s a bowling alley and restaurant in one! If bowling’s not your thing, then you can enjoy billiards or live entertainment. The menu at Splitsville has many gluten-free options including a spicy edamame appetizer and entrees including a couple signature sushi rolls, grilled salmon with mango chutney, a spicy veggie bowl, and more! It almost feels silly mentioning the coffee giant Starbucks here. But if you love coffee like we do, you’ll find a Starbucks coffee counter at Disney Springs (along with many of their gluten-free grab & go staples like Kind Bars, Goodie Girl cookies, and more). As an added bonus, it’s located close to the Lego Store making it easy to refuel while your kids play! STK Steakhouse is an upscale steakhouse with locations across the United States (and some international locations as well). While they don’t have a separate gluten-free menu, the chef will modify the majority of entrees to be gluten-free with the exception of items containing pasta and burger buns. 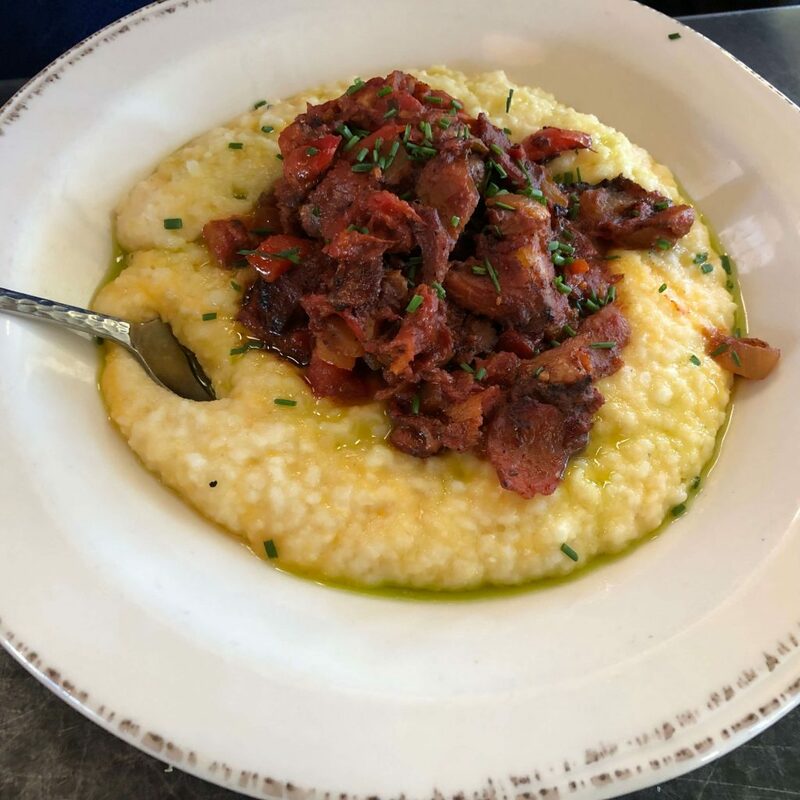 Enjoy their Raw Bar, seafood platters, steaks (all from the Linz Heritage Certified Black Angus Program), and other main course entrees such as Smoked Lobster & Grits or black truffle & butternut squash risotto. Wine Bar George houses over 140 wines, and their menu is exceptional. 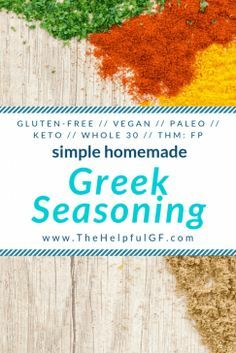 There are many gluten-free options (as well as vegetarian, lactose-free, and vegan options). Notable gluten-free options at Wine Bar George include various salads (such as the gluten-free & vegan Jicama-Kohlrabi Salad or the Grilled Octopus Salad), cheese boards (however, there are not gluten-free bread options for the cheeseboards), entrees (such as skirt steak & sea bass), and even a chocolate & wine pairing that is gluten-free. 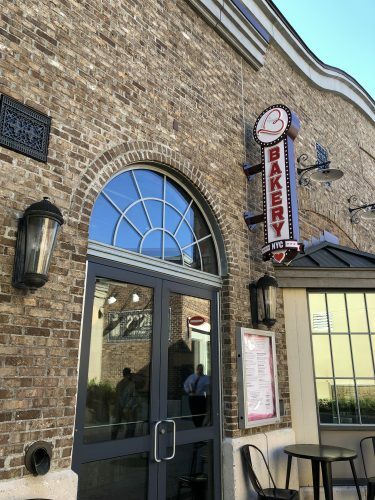 Not only does Disney Springs have restaurants that cater to gluten-free needs, but two bakeries that hit the mark as well. Did you know that regular flour particles can remain airborne for over 24 hours? This makes it basically impossible for a traditional bakery to produce gluten-free baked goods that are truly safe for Celiacs. In order to meet my standards, baked goods must be produced in a 100% gluten-free bakery. Both Erin McKenna’s NYC and Sprinkles Cupcakes meet these standards. Erin McKenna’s Bakery NYC has locations in New York, Los Angeles, and Orlando’s Disney Springs. This is a 100% gluten-free, vegan, nut-free, and refined-sugar free bakery. They also feature some of their menu items to resorts and restaurants across Disney World! You can also use Disney Dining snack credits here on items such as cupcake toppers, donuts, vegan soft serve, and cookies. I’ve done a whole in-depth review of Erin McKenna’s with amazing drool-worthy pictures. Click here to read it! While Sprinkles Cupcakes features both gluten-free and traditional baked goods, the gluten-free cupcakes are produced in a dedicated gluten-free facility and individually packaged for distribution in their various locations. While cupcake flavors vary by date and location, you should be able to find either (or both!) 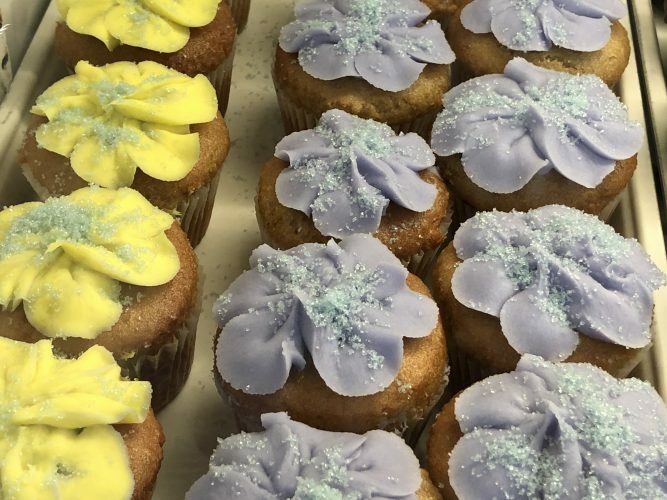 lemon blueberry or red velvet gluten-free cupcakes. There are many other restaurants at Disney Springs—and, in true Disney fashion, most will do their very best to accommodate. If you tried another restaurant that had excellent gluten-free accommodations, please comment below and let us know! Also, if you’re planning any kind of Disney vacation, be sure to contact Jillian for her amazing Disney planning services and tell her I, Sharon McCaskill from The Helpful GF, referred you! Enjoying lunch at Homecomin’ Kitchen!